Last nite while preparing for bed, my burns hurt me sooooo bad. I did not understand why? In the morning, the burn on the back of my right foot and calf, is intense when standing or walking. As I continue to walk, over time, that pain becomes manageable. In the evening, when I stop walking, that pain becomes intense again. I did get the relationship between pain when walking/not walking until this morning. 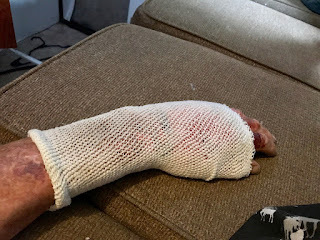 Thru research, I've learned that keeping my burns wet promotes healing [Link]. I am using Manuka Honey for a damp dressing And covering with a stretch bandage. The sentence imposed is a fine of $500. Nothing else. There is no criminal record of this matter. Last Saturday, I connected the Renogy Rover battery charge controller [Link]. Our solar panel is a Yingli 250 watt which is mounted on Tránsito's roof. A cable runs from the Yingli on the roof to the Renogy Rover inside Tránsito. Rover's output runs on a cable to Scampy's house battery. As of September 30th, my Blog shall no longer be open to all. Only to Readers who are invited. Please comment with your wish to be included in the list for Blog access. It's your Google name that is added to the list. So sorry you're still having so much pain with those burns. We ate at J's last night. You were so right... delicious and inexpensive! Kinda hung around the area this morning thinking you might need some help. May you heal and have comfort quickly. Now whale watching in Boiler/Depoe Bay area. My burns are giving me problems now, only in my left hand and wrist and the back of my right calf. That's a lot of progress in 10-days! That restaurant serves wonderful fried fish! Thank you for your sentiments about my burns! I hope you got rid of all synthetic jammie's and got cotton one's. My pajamas saved my life. My pajamas did NOT catch fire! The propane fire was sooooo intense, that the pajamas actually caramelized in the area of my left midsection. An area about 24" high. 12" wide. My doctor informed, that if I had NOT been wearing those pajamas at the time of the fire, I would not have survived. But if I did survive that fire, I would likely spent months of intensive care, with terrible pain. And in the end, would have died. PS: How do you know the material of those pajamas? I don't even know myself. I've been following you for many years, and would love to keep reading your blog, George. I appreciate your positive outlook on life and your tenacity to keep going in spite of life's many challenges. You are an inspiration to me! George, please add Juanita & Doug. We've followed you for 14 years and used to chat with David on his blog. Take good care of your burns. I've been following since you started traveling. Please add me. Hi George... me too please! Hmmm, I seem to be missing on your list. Boo hoo. George, me too please! I pray you will be feeling better soon. Please add me to your list, George. You have a long list of cyber friends that care about you. That should make you very happy. Those are some nasty burns. Please add me to your list as I've been with you since the beginning. Thanks! George. There were 2 requests on September 23 by Steve (mine was one) with no last name listed. I see one Steve has been added to your approved list and I wanted to see if it was mine. I am the Steve whose posting on my laptop says it happened at 11:08 am. My name appears after Vera and before L. Beman in the requests on September 23. If I have not yet been approved me, but you then do decide to approve me, you could list me as Steve M to clue me in. Thanks and hoping you have good outcomes with your current challenges. When you make a comment, you will be signed in with the Steve that is you. I am guessing that Google knows which Steve is you and which Steve is the other guy. When my Blog goes private on September 30th, if you are prevented from logging in to my Blog, email me and we will figure out what to do. Get a real Google name, and I will add you. Anonymous does not cut any ice around these parts. Click [Here] to create you own Google account! I'm glad that the 911 incident is behind you now. You were correct. And....I was prideful! Did you miss my name? I requested to be added days ago. George maybe you should go have your burns checked to make sure everything is going ok.
WRT your legal matter, I think you did the right thing by accepting the plea. You have to many other things going on and you probaby should move on from Oregon. Hi George, I would like to continue to read your blog. Thanks. I added my name a few days ago bu don't see it on your list? Smart decision George! You saved yourself money and unlimited hassle. Maybe time to hitch up the wagon and head for other environs. On the other hand seems you’ve become habituated to that general area, so what do I know? Hi George. I've been following you since 2004. I don't comment a lot but enjoy reading your daily adventures. You provide a lot of great full timing advise. Someday we will be fulltiming too! Just waiting for that big retirement date. I sent a posting earlier but do not see my name on the list. Hope your burns heal quickly! Take care and follow your dreams. George, please include me on the list. I've been reading your blog since day one. I found your blog recently and enjoy it a lot. I am splitting my reading between the older Miss Tioga posts and your current writings. Please include me on your list. Hi George, I've been following you for many years--please include me on your list. Please add me. My Google name is Owrudoin. Thanks! Please put me on your approved list. Hi George, I commented on what I believe was the original post but my name is not on the list. Thanks, Katie. I'd like to be included on your blog list. George, don't see my name on your list. So hoping that I will be included. Please have your burns/wounds checked, you sure don't want an infection. lunadelmar wants to be invited. Thank you for positive outlook -- even through the adversities of life. Hi George...We were happy to meet you in Newport a couple weeks ago after following your blog for many years. Please add us to your reader list. George - this is my fourth attempt to add my name. I'm not sure what I am doing wrong, my google name is En B. I've followed you since the beginning and named my very first RV after you. I am glad you are healing and wish you many more adventures. Please add me George. I start my day reading about your adventures. George, I no longer see my request, and unable to fined my name on list of approval. Dose that mean I'm rejected? Please add me, (long time reader).